Note — Don’t miss an important update at the bottom of this article, which includes an official statement from Xiaomi. Do you own an Android Smartphone from Xiaomi, HTC, Samsung, or OnePlus? If yes, then you must be aware that almost all smartphone manufacturers provide custom ROMs like CyanogenMod, Paranoid Android, MIUI and others with some pre-loaded themes and applications to increase the device’s performance. But do you have any idea about the pre-installed apps and services your manufacturer has installed on your device?, What are their purposes? And, Do they pose any threat to your security or privacy? With the same curiosity to find answers to these questions, a Computer Science student and security enthusiast from Netherlands who own a Xiaomi Mi4 smartphone started an investigation to know the purpose of a mysterious pre-installed app, dubbed AnalyticsCore.apk, that runs 24×7 in the background and reappeared even if you delete it. Xiaomi is one of the world’s largest smartphone manufacturers, which has previously been criticized for spreading malware, shipping handsets with pre-loaded spyware/adware and forked version of Android OS, and secretly stealing users’ data from the device without their permission. After asking about the purpose of AnalyticsCore app on company’s support forum and getting no response, Thijs Broenink reverse engineered the code and found that the app checks for a new update from the company’s official server every 24 hours. While making these requests, the app sends device identification information with it, including phone’s IMEI, Model, MAC address, Nonce, Package name as well as signature. If there is an updated app available on the server with the filename "Analytics.apk," it will automatically get downloaded and installed in the background without user interaction. "I couldn’t find any proof inside the Analytics app itself, so I am guessing that a higher privileged Xiaomi app runs the installation in the background," Broenink says in his blog post. Now the question is, Does your phone verify the correctness of the APK, and does it make sure that it is actually an Analytics app? Broenink found that there is no validation at all to check which APK is getting installed to user’s phone, which means there is a way for hackers to exploit this loophole. This also means Xiaomi can remotely and silently install any application on your device just by renaming it to "Analytics.apk" and hosting it on the server. "So it looks like Xiaomi can replace any (signed?) package they want silently on your device within 24 hours. And I’m not sure when this App Installer gets called, but I wonder if it’s possible to place your own Analytics.apk inside the correct dir, and wait for it to get installed," Broenink said. Since the researcher didn’t find the actual purpose of the AnalyticsCore app, neither on Googling nor on the company’s website, it is hard to say why Xiaomi has kept this mysterious "backdoor" on its millions of devices. As I previously said: There is no such backdoor that only its creator can access. So, what if hackers or any intelligence agency figure out how to exploit this backdoor to silently push malware onto millions of Xiaomi devices within just 24 hours? Ironically, the device connects and receive updates over HTTP connection, exposing the whole process to Man-in-the-Middle attacks. "This sounds like a vulnerability to me anyhow, since they have your IMEI and Device Model, they can install any APK for your device specifically," Broenink said. Even on the Xiaomi discussion forum, multiple users have shown their concerns about the existence of this mysterious APK and its purpose. "Don’t know what purpose does it serve. Even after deleting the file it reappears after some time," one user said. Another said, "if I go to battery usage app, this app is always at the top. It is eating away at resources I believe." How to Block Secret Installation? As a temporary workaround, Xiaomi users can block all connections to Xiaomi related domains using a firewall app. No one from Xiaomi team has yet commented on its forum about the question raised by Broenink. We’ll update the story as soon as we heard from the company. Meanwhile, if you are a Xiaomi user and has experienced anything fishy on your device, hit the comments below and let us know. "AnalyticsCore is a built-in MIUI system component that is used by MIUI components for the purpose of data analysis to help improve user experience, such as MIUI Error Analytics." Although the company did not deny or comment anything about its ability to automatically install any app onto your device in the background without your interaction, the spokesperson has clarified that hackers would not be able to exploit this "self-upgrade" feature. "As a security measure, MIUI checks the signature of the Analytics.apk app during installation or upgrade to ensure that only the APK with the official and correct signature will be installed," the representative added. "Any APK without an official signature will fail to install. As AnalyticsCore is key to ensuring better user experience, it supports a self-upgrade feature. Starting from MIUI V7.3 released in April/May, HTTPS was enabled to further secure data transfer, to prevent any man-in-the-middle attacks." 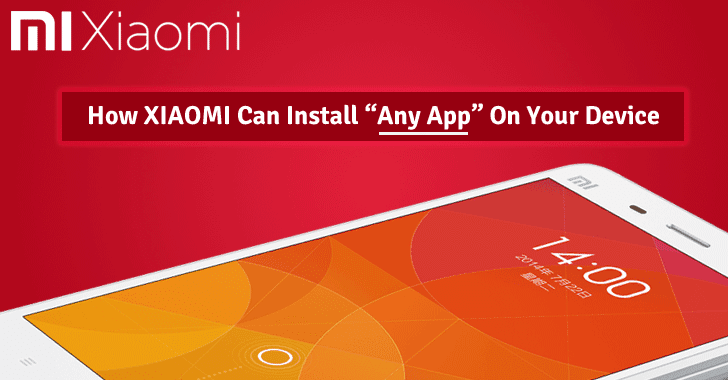 We have further reached out Xiaomi for a comment on its ability to auto-install apps without user’s interactions.